Farmers in Madagascar’s southwestern province of Tulear have been hit hard, first by floods and then by locusts, threatening food security in a region already among the poorest in the country. 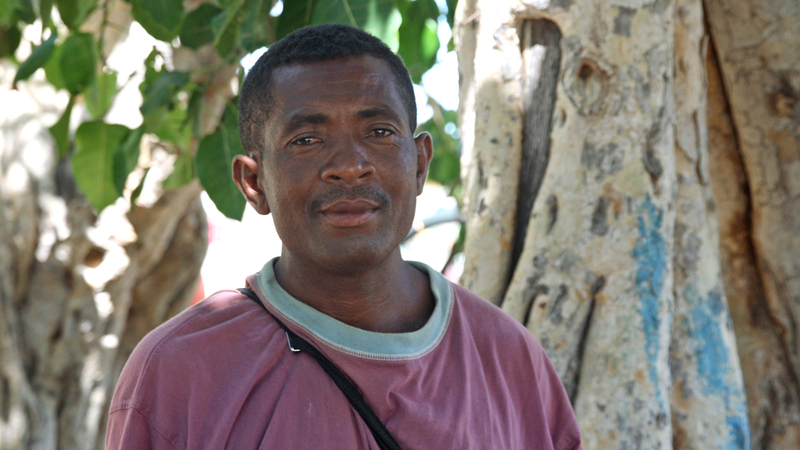 Tsitindry, 52, a farmer in the Fenoarivo community, about 100km south of Tulear city, usually earns a reasonable living from his seven hectares of land. “In former years, when the rains were good, I could produce 100 bags of rice and 70 bags of beans. We would eat about 30 percent ourselves and the rest we sold on the market. From the profits we bought what we needed, and from our savings I bought four zebus [hump-backed cattle],” he told IRIN. In February of this year the region was hit by cyclone Haruna, which flooded and completely destroyed Tsitindry’s rice and maize fields. He sold two of his zebus to raise money and planted vegetables when the water receded, but now these fields are being attacked by swarms of locusts. Last week the farmer’s two remaining cows were stolen by the Dahalo, cattle rustlers who have free reign in southern Madagascar. Tsitindry says he has resorted to burning trees to make charcoal so as to earn a little money. "During the day we all stay in the fields to make sure the locusts don't come back and eat the leftover crops"
“In the last weeks we’ve had many farmers from the remote villages coming here to ask for help,” said Dieu Donne Hajasoa, a technical advisor at the ITAFA (Ivotoerana TAntsoroka ho amin'ny FAmpivoarana), an information centre for farmers and fishermen funded by the UN Development Programme (UNDP) in St. Augustin, a fishing village 35km from Tulear city. According to the UN Food and Agricultural Organization (FAO), cyclone Haruna not only damaged crops and homes but also provided optimal conditions for locusts to breed. About half of Madagascar is now infested by hoppers and flying swarms, each made up of billions of plant-devouring insects. The FAO estimates that about two-thirds of the island country will be affected by the locust plague by September 2013 if no action is taken. The agency is trying to raise US$41 million to respond to the current emergency and implement a three-year campaign to prevent future infestations. Since the start of Madagascar’s political crisis in 2009, the National Anti-Locust Centre (CAN), has not been able to carry out necessary prevention work, mainly due to a lack of funds. Elsewhere in Tulear Province, both farmers and city dwellers are struggling to rebuild their livelihoods after Haruna. “The cyclone came at night and we put bags on our roof. In the morning we started to congratulate each other, as the rain stopped and the house was fine. That’s when people started running up the hill. The dyke had broken and the water was rising fast. We put the children on higher ground and went back to save the furniture, but when we came back to the house we had to swim. We only managed to close the windows,” said Tiandrainy, 52, a former teacher who lived on the street with his family until the flood waters subsided. It was two weeks before the family received any aid, and Tiandrainy was forced to borrow money at 50 percent interest to survive, which he is struggling to repay. He is now group leader at a food-for-work project set up by CARE International and the UN World Food Programme (WFP), which enables him to earn food for his family, while his wife is trying to make an income as a vendor. “We’re trying not to eat all the food now, but to save some for later. This project will only last one month, and the money my wife earns needs to be used to pay back our debt,” he told IRIN. Fields in this area normally produce the vegetables sold in the city’s markets, but they were also destroyed by the floods. In Miary, a WFP distribution site outside Tulear city, aid workers carefully count out cups of maize. Clementine Claudette and her eight children are among the 3,500 beneficiaries receiving food in return for cleaning up an irrigation canal, while her husband tries to replant some maize. The food-for-work project is about to end, but it will be four months before the family can harvest a crop. “We’ll try to live off little jobs, like transporting wood to the city and making charcoal,” Claudette said. According to WFP figures, Cyclone Haruna affected over 50,000 people in the region. After reaching 32,000 people with emergency aid, more than 13,000 are now enrolled in food-for-work projects. In Tulear city, where the markets now have food again, these programmes will become cash-for-work projects, starting in May.